Aquaculture insurance has a broader effect than mitigating direct climate-risk impacts to primary producers. One such broader effect is that it spurs the adoption of better farm management practices and new technology, which contributes to reducing disease risks and thus boosts credit worthiness of farmers. Another impact is that it enables farmers to become better organized and participate actively in risk management programmes in a more cost-effective manner. These benefits from insurance enhance the adaptive capacities of fish farm enterprises to changes and impart more resilience on the overall value chain. Aquaculture insurance should be seen as a public investment and partnership between government, insurers, farmer groups and other value chain players. As such, a well-designed insurance programme would lighten the governments' burden of disaster recovery and rehabilitation efforts. Some governments have made it part of their climate change adaptation strategy and use aquaculture insurance as a policy instrument for social protection of small, resource-poor farmers. Almost 90 percent of the world's aquaculture production comes from Asia. The applications of aquaculture insurance and its positive effects assume great significance with the fact that 80 percent of the fish farmers in Asia are small-scale, many are resource poor, operating in areas that are usually sited in or near fragile ecosystems or exposed environments, and are probably the world's most vulnerable to disasters. Experiences gleaned from recent studies carried out by FAO and national research and development institutions as well as a 2016 workshop illustrate the above-mentioned effects. These recent studies include a review of the national pilot programme on agriculture insurance in Viet Nam (1) and a review of fishery and aquaculture insurance in China (2). The regional workshop was held in Bangkok, Thailand on the development of national aquaculture insurance systems for small-scale farmers in September 2016 (3). These studies and workshop also demonstrate challenges and conditions to take into consideration when developing this type of financial service and making it accessible to small-scale farmers. This Special Feature article will summarize aspects of these findings to highlight the benefits of aquaculture insurance, some of its challenges, and how insurance can ultimately empower small-scale aquaculture farmers. 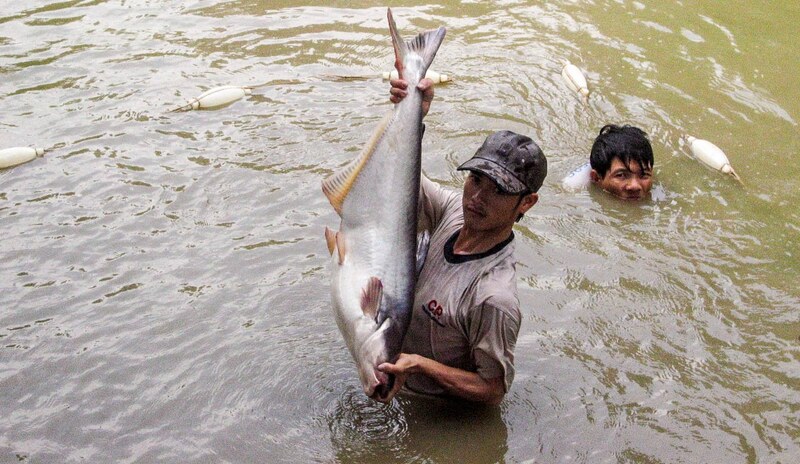 China produces more than 60 percent of the world's aquaculture output. Every year from 2009 to 2014, its disaster-affected aquaculture area was estimated to total 815 000 to more than a million hectares. China strongly promotes and subsidizes aquaculture and fishery insurance and encourages commercial insurers to work with mutual insurance associations and producers' cooperatives. In Shanghai, a shrimp farmers' cooperative and the Axin Agriculture Insurance Company has developed a cooperative and commercial model by which the company provides a professional insurance service to the cooperative while the cooperative lends technical support to the company. This partnership offers several advantages. The insurer enters into a contract only with the cooperative, which in turn contracts its members. This simplifies the administration of the policy. The cooperatives usually have experienced members to help the insurer in the identification, characterization and technical assessment of risks, which avoids moral hazard and reduces the insurer's cost. As the members farm the same species, it is easy for them to share information and technology on better farm management practices, which collectively increases their ability to manage production risks. In this model, the cooperative introduced the adoption of good shrimp aquaculture standards and the closed system to members, which prevented pathogen entry and reduced the use of drugs and chemicals. The insurance company provided a bonus to the cooperative for a low loss ratio (loss ratio is the total compensation paid out divided by the total premium collected by the insurer), i.e. 60 percent or lower, as an incentive for its members to adopt good farm management practices. In the 2015 crop, the loss ratio was a low 53 percent. As it had promised, the insurer returned 7 percent of the premium income to the cooperative, which the members spent on materials for water quality improvement. Insured and insurers in China have in particular experienced the advantages and benefits of weather-indexed insurance (or parametric insurance) over the more common indemnity-based policy. Covered under such schemes are a number of commodities such as laver, scallops and sea cucumber (for wind speeds exceeding certain velocities) as well as mitten crabs and oysters (for air temperatures reaching a certain elevated level over a number of consecutive days). A major advantage of having weather-indexed insurance is the avoidance of adverse selection and moral hazard, two common pitfalls of traditional indemnity-based insurance to insurers. The other significant advantage is it does away with a loss adjustment, which reduces the insurer's cost and speeds up payment of compensation. Instead, payout is triggered when the index goes above or falls below a pre-specified threshold. The critical technical service support for weather-indexed insurance is a competent meteorological station that provides timely, secure and reliable records of the required weather parameters. In Viet Nam, there was a pilot agriculture insurance programme carried out between 2011–2013, which was part of the government's social protection policy for farmers. It was meant to help them recover from natural disaster and disease outbreaks. Of the three components (crop, livestock, aquaculture) in the pilot, aquaculture insurance was deemed unsuccessful. That said, US$30 million was paid out, mostly to shrimp farmers in the five pilot provinces, which enabled them to immediately resume farming after suffering from the ravages of Early Mortality Syndrome (EMS). The insurers reported high levels of financial loss, which was part of the reason why the aquaculture programme was deemed unsuccessful. The reasons for this loss can be instructive for developing aquaculture insurance schemes in the future. In Viet Nam's case, some crucial strategic measures and institutional services were overlooked that would have strengthened the technical capacities of farmers to reduce the risks that caused huge crop losses. One strategic omission was the lack of consultation with farmer associations, rural credit institutions, and cooperatives to design insurance products that would have been more suitable to the farmers' needs and circumstances. In Viet Nam, premium subsidies are based on the farm household's income. A poor household's premium is subsidized completely at 100 percent. However, the programme assessment demonstrated that this caused an issue: without having to pay anything themselves, farmers tended to ignore the prescribed technical and management guidelines with the subsidy becoming a perverse incentive. Thus, the assessment recommended reducing the subsidy for the next pilot programme in order to give the farmer a greater sense of responsibility and to promote more vigorous compliance with technical guidelines for disease control and adhere to better farming practices. Interestingly, both China and Viet Nam's insurance programmes provide generous subsidies to farmers for premium payments. The key distinction is that the farmers in China are organized into well-managed cooperatives and insurance mutuals that adopt risk management strategies and encourage their members to take up good farm management practices as part of the conditions for being insured. In Thailand, EMS outbreaks from 2012 to 2015 have caused economic losses throughout the shrimp value chain that total more than US$12 billion. Most shrimp farmers in Thailand are small-scale, operating an average of 1–2 ponds (usually less than a hectare) per farm but are stocked at high density. The industry has periodically suffered from disease, but in recent years, stakeholders have worked together to develop innovations to combat old and new diseases. Extensive laboratory services and inspection mechanisms are now in place to support the adoption of good aquaculture practices and product traceability and certification. Farmers are preparing to become insurance-ready through a shrimp cluster model, a type of collective action model. The initiative is led by the Thai National Farmers Council in collaboration with the Thai Chamber of Commerce. It operates by linking institutionalized farmer groups with other stakeholders – seed and feed producers, buyers, processors, exporters, credit institutions, government regulatory and technical agencies, and insurers. At the farm level, the shrimp farmers' cluster cooperatives should adhere to good aquaculture practices and product certification standards. They also would have to comply, should it be required of them, with buyers' own product quality standards. From a risk management perspective, these attributes add up to the member farmers becoming more insurance-worthy, which is a necessary condition for aquaculture insurance being a viable business. The ups and downs experienced by the Thai shrimp industry in more than 30 years since it started have driven home the lesson that managing the sector should be inclusive by involving all the stakeholders along the value chain. Thus, insurance as a risk management tool cannot be a stand-alone tool. Rather, it needs to be integrated with other value chain management mechanisms. Having been accepted by policy makers as a climate change adaptation strategy, insurance initiatives have moved to the practical issue of making aquaculture insurance a viable and sustainable business. This outcome is predicated on farmers being able to participate continuously in an insurance programme. The biggest hurdle currently is the fact that 80 percent of fish farmers in Asia, where the majority of aquaculture is produced, are small-scale. Models such as the Thai shrimp sector's cluster form and the Chinese insurance mutuals and cooperatives can help small-scale farmers become insurance-ready by becoming better organized. Such models also impart economy of scale, which translates to a stronger transaction power – based on trust – with input suppliers and product buyers. It also gives farmers better leverage with government and other institutional providers of services. That leverage is anchored on their capacity and reliability to comply with conditions attached to a service such as a loan and an insurance contract. Ultimately, the key to farmers being able to participate continuously in an insurance programme and the insurance companies finding insuring small-scale farmers a viable business, is for farmers to be well organized, strengthened and empowered. The empowerment of small-scale fish farmers – usually the most vulnerable and weakest link in the value chain – makes the entire value chain more resilient. Insurance, by reducing farmers' vulnerabilities, can help. (1) FAO. 2016. Aquaculture insurance in Viet Nam: Experiences from the pilot programme, by Kim Anh Thi Nguyen and Tipparat Pongthanapanich. FAO Fisheries and Aquaculture Circular No. C1133 Rome, Italy. (3) Organized by FAO and the Center for Applied Economics Research of Kasetsart University in Bangkok, the workshop included 62 participants from government agriculture and fishery agencies, insurance and reinsurance companies, insurance brokers, development financing institutions, regional and international development organizations, research institutes and universities, the National Farmers Council of Thailand, and representatives of shrimp farmers' cooperatives in Thailand. Participants were from China, the Philippines, Singapore, Thailand and Viet Nam.